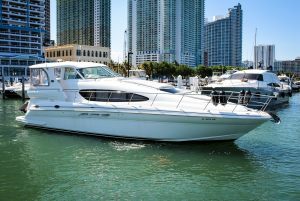 The 50′ Sea Ray Motor Yacht galley has good stowage for extended cruising. It’s tough to find wasted space. A large drawer slides under the dinette bench, drawers slide out with bins, and there are cabinets above and below the counter. Every drawer has a purpose, and there is a spot for everything, including the stacked dual-voltage refrigerator and freezer. 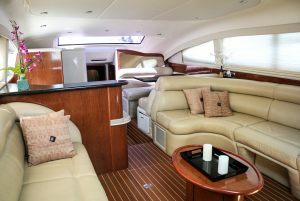 In the saloon, a U-shape settee to starboard and a straight settee to port are wrapped in easy-to-clean UltraLeather. 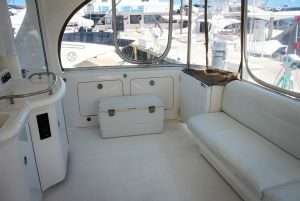 While cruising, you can plop down on any of these settees and see the water around you. 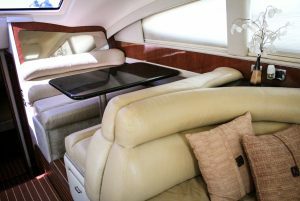 The sense of space is appealing, thanks to the open arrangement and abundant light. 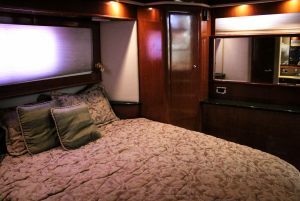 The aft-cabin arrangement works well and includes a walk-around queen berth with innerspring mattress, a full-length cedar-lined hanging locker, an entertainment center and a split head. The doorway to the saloon is narrow by industry standards and may require anyone with a little girth to do a side-step entrance. 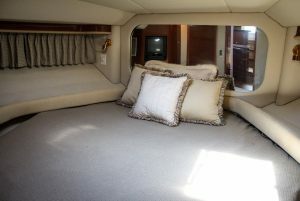 There are two guest staterooms forward, one with twin berths and the other with an island. 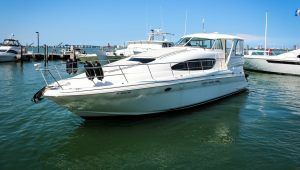 The head serves both staterooms, and access from the passageway is a plus. 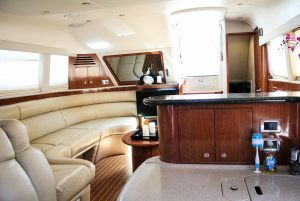 Another bonus is the utility room, accessed by lifting the stairs to the galley. 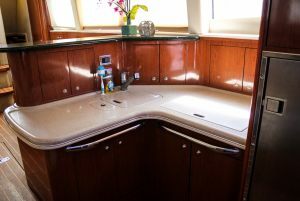 The utility space has a standard washer/dryer combo and enough shelves to stow spare parts and provisions. 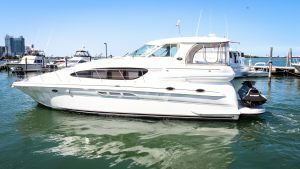 Sea Ray placed the water manifold system on the after bulkhead, which allows any faucet to be isolated in case of a leak. 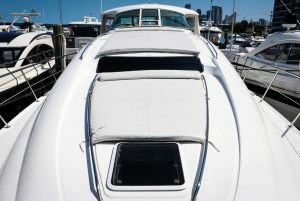 Although the interior is nicely finished, the covered helm deck likely will see the most use. 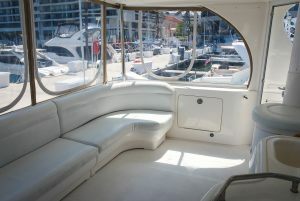 The helm deck on our test boat was enclosed and fully air conditioned. 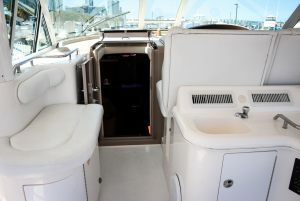 A wet bar is centrally located behind the helm, which is expertly engineered. 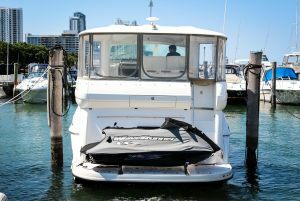 All vital gauges are in the line of sight, and the seat and wheel position feel natural. 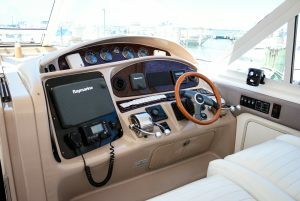 The line of sight aft is also good, and the cockpit door is abaft the helm to ease docking in tight quarters. 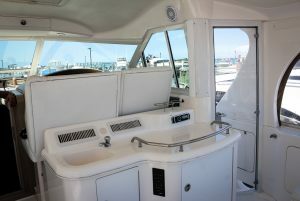 A bench seat flanks the helm, and stowage opens along the side with plenty of space for life jackets, chairs and deck gear.